When you have a small garden you want to get as much bang for your buck as possible. Enter this great cultivar of English Lavender that blooms not just once but over and over again until frost. 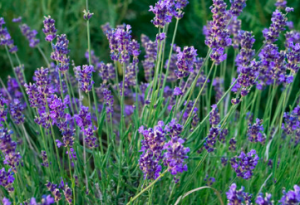 Medium lavender blue flowers cluster at the top of straight wiry stems to 10″ long. A naturally compact plant to about 2′ x 2′ ultimately. Silver evergreen aromatic foliage. Rich, to average well drained soil in full sun with light summer water. Somewhat drought adapted. Looks better , re-blooms better with light water. Saches, Lavender wands, potpourri- everblooming fragrant hedge. Very good Pastor. Very good.